It was a great honor for me to assist welcoming "Nada Butake" back to the Lawai International Center on Friday, September 30th. "Nada Butake" must have been happy, being well-taken care by Hindu Temple but it was time to go home where it was once worshiped. When I saw Nada Butake at Hindu Temple for my first time in 2005, I couldn’t recognize him. 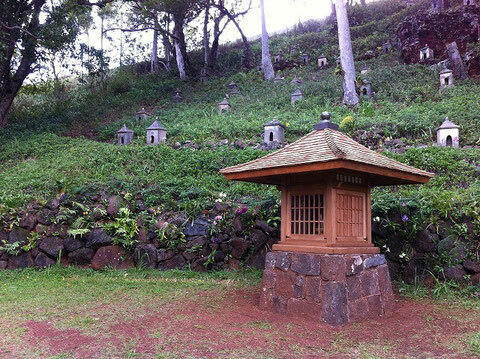 Even after I heard it came from Lawai 88 shrines, I had no idea who it was. 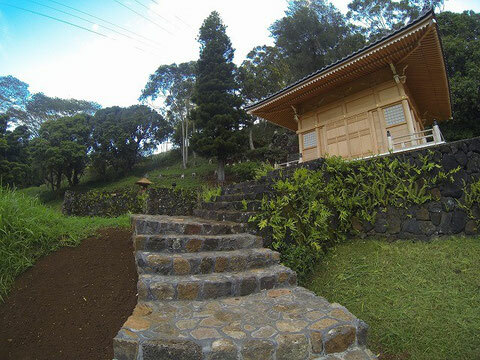 But after I had a connection between Lawai, I was able to guess “it must be Binzuru” when I was asked who it was in the picture. The picture reminded me of Binzuru at my home temple in Japan. There were a few similarities. Binzuru at Daisenji Temple, Niigata, Japan. Then I happened to watch a TV program to introduce “Zenkoji Temple” in Nagano and I knew "Binzuru" at Zenkoji is sometimes called “Nade Botoke.” For me, it was an amazing moment that the mystery of "Nada Butake" was resolved. So “Nade Botoke” literally means “Rubbing Buddha” and it is believed to help people recover from their sickness or injury when they rub it on the same part as the sick part of their bodies. “Nade Botoke” at Zenkoji Temple gets worn out so much at every part of the body because he has been rubbed by so many people for hundreds of years. 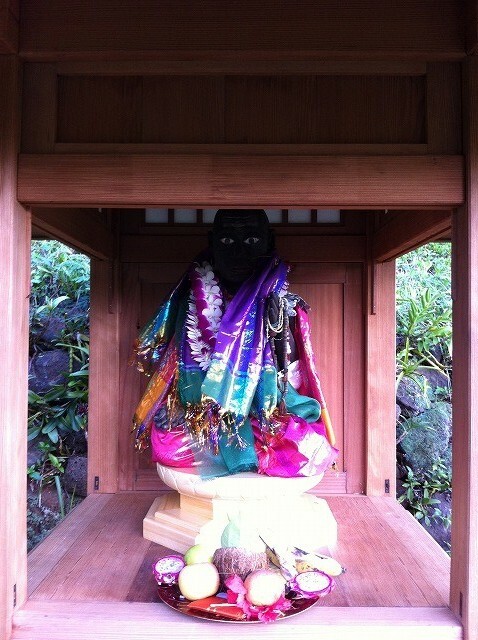 On the other hand, “Nade Botoke” at my home temple has little sign of rubbing because people has used Treasure- ball called,”Houju” to rub the sick parts of the bodies instead of rubbing the statue directly. Binzuru was one of the disciples of Shakyamuni Buddha. Because he was very good at delivering sermon, he was said to be No.1 preacher among many students of Shakyamuni Buddha and later he was known as one of 16 great Arhat. Arhat or “Rakan” in Japanese, is a kind of title who achieved the highest level of enlightenment. 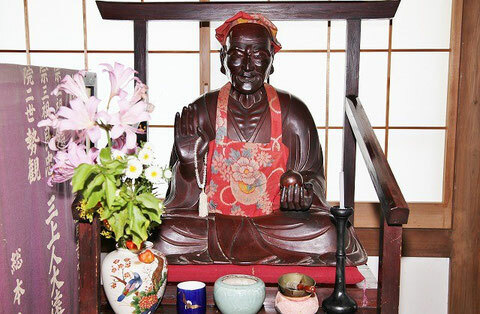 Since the word “Arhat” literally meant “to be worthy,” it was translated as “応供(ougu)” in Chinese, meaning the saint who is worth receiving offering. Arhat is also translated into Chinese as "無学位(Mugakui)” meaning "the rank who are not necessary to study further." So he is sometimes considered to be a buddha and sometimes considered to be the highest rank of bodhisattva and above all he was the most popular among 500 arhat. One of the reasons why Binzuru was the most popular was, I think, because he liked alcohol! (That's why his body is red in many caese.) This implyed that Binzuru was not perfect being and made people feel he had a friendly disposition. Because Buddhism encourages not to drink sake, Binzuru who looked like drunk, cannot be main image of the temple. That is why he is always placed near the entrance and sometimes outside of the temple building. But because of this location, people can feel free to touch the statue. In like manner, Binzuru or Nada Butake or Nade Botoke, was placed outside of the hall of compassion at Lawai but I do believe he is very happy to have a new house, supported by many people.